Microsoft’s Windows RT-powered Surface 2 tablet may not be officially dead, but the executioner is sharpening his axe. Microsoft confirmed Tuesday that the Surface 2 is no longer being manufactured, meaning that, at least at Microsoft, no Windows RT tablets are being made. That doesn’t mean that either the Surface or Surface 2, or Windows RT, won't be supported at Microsoft. Microsoft executives said last week that the Surface 2 would receive an update that would bring at least some of the features of the upcoming Windows 10 release to the platform. But clearly, the end is nigh. A Microsoft spokesman confirmed that Microsoft has stopped manufacturing the Surface, a day after the company sold out of the Surface 2 tablet at its online store. “That manufacturing statement is true, but we previously stated that the Surfaces running Windows RT (Surface RT and Surface 2) will receive an update that will have some of the functionality of Windows 10,” a spokesman said in an email to PCWorld. 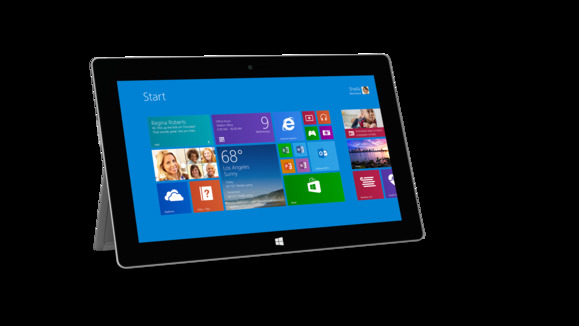 Outside of the Surface 2's availability at Best Buy, the only Windows RT tablet available is Microsoft’s Nokia Lumia 2520. A 32 GB model is available through Verizon for $599.99 without a contract and $499.99 with a two-year contract commitment. Microsoft officials weren’t immediately able to confirm whether Microsoft was halting production of the Lumia 2520 as well. Why this matters: At this point, Windows RT is dead in all but name. But Microsoft is reluctant to discard those customers who bought into the Surface and Surface 2 vision, and purchased one of the early tablets. Still, discontinuing the Surface 2 tablet from a manufacturing perspective sends the message that the basic Surface line is dead, without kicking those early customers to the curb. Microsoft announced the Surface tablet at an event in Los Angeles in June 2012, where the tablet turned heads with its hardware design, its kickstand, and a version of Windows that didn’t need X86 processors manufactured by Intel or AMD to run. But while the Surface tablet could run virtually any Windows application, the Surface tablet needed special applications written for the Windows RT OS and the ARM processors that powered it. Microsoft’s app store already suffered from a shortfall of apps, period; Windows RT “Metro” apps were even rarer. Fortunately, what the Surface was designed to do—surf the Web, run Microsoft apps like OneNote and Skype, as well as a version of Office—still worked fine. And Microsoft isn’t about to write off Windows RT just yet, at least where Windows 10 is concerned. “ARM devices will continue to be a crucial part of the range of devices Windows 10 supports, with an optimized experience for ARM-based phones, phablets and small tablets up to 8 inches,” the Microsoft spokesman wrote. “Windows 10 is a single OS that spans multiple device form factors, including tablets. We believe users will be delighted with how the OS will optimize based on the device they are on, whether that is a phone, tablet, PC or beyond,” he added. Meanwhile, the reception for the Surface Pro 3 has steadily warmed, with positive reviews from PCWorld and others. Microsoft said Monday night that revenue for the entire Surface line alone exceeded $1 billion for the quarter. Analysts, including Jan Dawson, estimated that Microsoft’s gross margins for the Surface climbed considerably—evidence that customers are buying the higher-priced Surface Pro 3, rather than the cheaper Windows RT models like the Surface 2. While it’s unfair to write off the Surface 2 completely—the update promises to keep the tablet and the Windows RT platform alive a while longer—it’s also just about official: Microsoft’s Surface 2 is over, and Windows RT is looking at a very grim future. Additional reporting by Agam Shah of IDG News Service.